The billionaires who fund the American Hard Right are salivating over the prospect of seizing control of City Hall in Newark,New Jersey, May 14. They have found their champion: Cory Booker, Black mayoral candidate from the city's Central Ward, a cynical pretender who attempts to position himself as the common people's defender while locked in the deep embrace of institutes and foundations that bankroll virtually every assault on social and economic justice in America. His benefactors sponsor anti-affirmative action referendums, press for near-total disinvestment in the public sector, savage what's left of the social safety net, and are attempting to turn public education over to private suppliers. Along the way, Booker's soul mates are busy ravaging the environment and trampling civil liberties everywhere they find them. Booker owes his growing national prominence to this crowd, whose influence has provided the 32 year-old with a campaign war chest rivaling that of four-term incumbent Sharpe James. Never has a Newark election been more closely watched by the super-rich and their political network. Booker is their Black Hope for electoral legitimacy. Although only a first-term councilman from a medium-sized city, the former Rhodes scholar is already at the top of the Right's list of New Black Leaders. Republicans have a lot riding on Booker, a nominal Democrat. Despite over two decades of financing inept and unattractive Black hired guns, most of them hustlers from academia, ultra-conservatives have failed to place an African American of their own at the controls of a mostly non-white city. The practical and propaganda effects of such a coup would be dramatic - and possibly devastating to the Democratic Party, nationally. Booker's anointment as a prince in the Hard Right pantheon is based on his support of public vouchers for private schools. This "movement," the creation of right-wing paymasters like the Bradley Foundation, of Milwaukee, and the Walton Family Foundation, Bentonville, Arkansas, hopes to drive a wedge between urban Blacks and the teachers unions. Without amicable relations between these two Democratic pillars, the Party, as we know it, is finished. Booker is the Right's eager ally. He is adored in the corridors of the Heritage, Hoover, Manhattan and American Enterprise Institutes, think tanks that handle publicity and publication for the Bradley and Walton moneybags. This opportunistic young man is comfortable in the company of people whose political ancestors hosed down and blew up Black children in Birmingham, but now express deep compassion for these same children. Booker announced his candidacy for mayor under a bright winter sky, his podium framed by the twin towers of Brick House, a troubled, low and moderate income development where he once used his Yale Law School skills in defense of tenants rights. A local minister with impeccable progressive credentials asked God to "bless Cory and Team Booker.... This city needs a renewal, for our people are perishing." Booker's headquarters sits on a hill overlooking downtown. Pointing toward the revitalized business district, the fashionably bald, former Stanford football player called for "a Renaissance for the rest of us." It was great grassroots, populist rhetoric, perfectly pitched for an insurgent campaign in an overwhelmingly Black and Hispanic city. Booker made a show of running against downtown business interests, attempting to paint his 65 year-old opponent as a tool of the rich. Few in the crowd were aware that Booker's own allegiances are far more dangerous - and vastly richer. The word "vouchers" failed to form on Booker's lips; that might have set off alarms. People of color tend to get nervous when they hear cheering from the box seats of the Right. Newark is the largest urban center in a state where even much of the GOP was repelled by Republican former Jersey City Mayor Bret Schundler's 2001 gubernatorial campaign, built largely around the issue of school vouchers. But Schundler and Booker are tight, traveling in the same far-right direction - where the money is. Together with wealthy Republican businessman Peter Denton, the trio founded Excellent Education for Everyone, a local non-profit pocket with which to stuff foundation and corporate contributions. Booker's pal Schundler knows his way around that kind of money. He used a big chunk of a $500,000 Walton Foundation gift to his Scholarships for Jersey City Children non-profit to pay for advertisements featuring himself, during an election campaign. Walton's executives didn't object. Apparently, what's good for their candidate is good for the kids. After establishing their non-profit, the two Republicans and Booker went on a pilgrimage to Milwaukee, Mecca for school "choice" money, where the Bradley Foundation was concocting its newest invention: the Black Alliance for Educational Options (BAEO). Naturally, Schundler couldn't join. But Booker became a member of the board. It is the BAEO and its patrons that have propelled a one-term councilman into places of honor at the tables of the right-wing rich. The Free Congress Foundation proclaimed Booker among the nation's top four "New Black Leaders," along with J.C. Watts, the Republican congressman from Oklahoma; Deborah Walden-Ford, a professional Right operative who also sits on the BAEO board; and Star Parker, a Republican former welfare mother turned ultra-conservative speaking circuit maven. The Free Congress Foundation gets a fat check every year from Bradley - $425,000 in 2000. Parker sits on the board of Black America's Political Action Committee (BAMPAC), the political toy of the ridiculous Alan Keyes, 1996 GOP presidential candidate and MSNBC talk-show host. White Republicans get most of BAMPAC's campaign contributions, but Cory Booker certainly qualifies for access to some of Keyes' more than $2 million treasury. Last year, Booker won the first BAMPAC Leader of Tomorrow Award, bestowed on those "under 40 who promote the BAMPAC mission and are seen as rising stars on the political landscape." Booker's stock soared in the circles of selfish wealth. The Manhattan Institute, home of a repulsive roster of right-wing writers and speakers, and recipient of $250,000 in Bradley money in 2000, invited Booker to one of its power lunches, where he effortlessly dropped Right-speak code words. "The old paradigm," he told the troglodytes, "was an entitlement program, in which large big city mayors controlled race-based machines. "What that was really about was capturing big entitlements from the state and federal government and divvying them up among their cronies or among the people within their organizations to protect and preserve their organizations. It was about distributing wealth." In just two sentences, Booker managed to stimulate the Right's erogenous zones by mentioning three of the phrases they most love to hate: "race-based," "entitlements," and "distributing wealth." This guy is good, very good. He speaks two distinct languages - one to the people he wants to elect him mayor of Newark, the other to the financially endowed, whose mission in life is to resist redistribution of wealth to race-based groups that think the poor could use some entitlements. Of course, Black collaborators are entitled to all the money necessary to create an alternative political movement out of whole cloth. Bradley Foundation president Michael Joyce is the Wizard behind the curtain in Milwaukee. Joyce's racial and educational views can be gauged by his praise for the author of "The Bell Curve," the infamous, American Enterprise Institute-backed book disparaging Black intelligence. "Charles Murray, in my opinion," said Joyce, "is one of the foremost social thinkers in this country." Bradley gave the AEI, one of its favorite think tanks, $825,000 in 2000. Charles Murray personally amassed about $1 million dollars from Bradley during his tenure with AEI. The Black Alliance for Educational Options has no life independent of Bradley and its wicked sister, the Walton Foundation (Bret Schundler's benefactor). In a December 2001, report, the liberal People for the American Way (PFAW) asked, rhetorically, is the BAEO a "Community Voice or Captive of the Right?" Transparency in Media, which keeps track of right-wing foundations, describes the BAEO as "a project" of the Bradley Foundation. We at The Black Commentator have concluded that Cory Booker's organization is a wholly-owned subsidiary of Bradley and Walton, who play tag team coughing up the dollars that keep its board members on the hustle. The BAEO board is a motley crew, brought together by Dr. Howard Fuller, the Black former Milwaukee Superintendent of Schools who resigned the post in 1995, crushed when teachers union-backed candidates captured four of five seats on the school board, frustrating his privatization plans. He's been seeking revenge, ever since, armed with Bradley's checks. By PFAW's estimate, Fuller's BAEO has received $1.7 million from Bradley since June of 2001, on top of the expense of birthing the phony group. The Walton Foundation came up with $900,000 in seed money. Booker and his New Jersey GOP buddies, Schundler and Denton, journeyed to Milwaukee to attend a BAEO "symposium" subsidized by $125,000 from Bradley and hosted by Fuller's Bradley-funded Institute for the Transformation of Learning. The Institute is headquartered at Marquette University, a much-favored campus of both Bradley and Walton. Fuller's staff provides training and indoctrination for private and charter school administrators. Its syllabus is blatantly political. Workshops, run by BAEO board member Zakiya Courtney, teach "the purposes and recent development in charter schools, choice schools and the reform movement." Classes are designed for school choice activists, who are taught how to "network with one another and various supporters of school reform." Remember, the word "reform" means "privatization" in Right-speak. "Choice schools," in Fuller's lexicon, are private schools. Ronald Reagan's favorite economist, Milton Friedman, instructed his small but very loud foundation to contribute $30,000 to the symposium. Then, Friedman's media folks got busy shaping the BAEO's public face, spending an additional $230,000 fine-tuning pro-voucher ads for a campaign that the Christian Science Monitor valued at $3 million. The TV, radio and print blitz in selected markets around the country featured Black and brown children, and included ads in 12 minority publications. BAEO board members fanned out across the country, attempting to make good on chairman Fuller's vow to "change the face" of the school voucher "movement." But the sheer size and cost of the propaganda frenzy belied its origins. This was no Black, grassroots movement, but an extravagantly funded, right-wing orchestration. Ms. Virginia Walden-Ford, of Washington, DC., is, as previously mentioned, a darling of the Right. She shared top billing, along with Booker, among the Free Congress Foundation's nominees for New Black Leadership. Walden-Ford is executive director of D.C. Parents for School Choice, which received $75,000 from Bradley in 1999 - 2000. She is also an operative of the National Center for Neighborhood Enterprise (NCNE), the notorious Black GOP invention headed by Robert Woodson. The NCNE has been funded to the tune of $6 million by far-right foundations since 1995, including $450,000 in "ongoing," yearly support from Bradley and more than $100,000 from Bradley's Milwaukee neighbor, the ultra-conservative Helen Bader Foundation. Woodson spent much of his career as a Bradley Fellow with the American Enterprise Institute, a colleague of Charles "Bell Curve" Murray. Former Queens congressman Floyd Flake, the only member of the Congressional Black Caucus to support school vouchers while in office, is the BAEO's most successful practitioner of the art of turning public issues to private gain. He appears to have retired from electoral politics in order to further his financial fortunes among the money men of the Right. Flake is president of Edison Schools, a for-profit corporation that hovers like a vulture over all of the nation's troubled schools, hoping that systems are declared failures so that Edison might pluck out a public fee to "save" them. As befits his senior status, Flake wears many right-wing hats, among them, "commissioner" on the Citizens Initiative on Race and Ethnicity, a joint venture of the Manhattan and Hoover Institutes, recipients of $250,000 and $200,000 from Bradley, respectively, in 2000. Flake's fellow commissioners share the same benefactor. 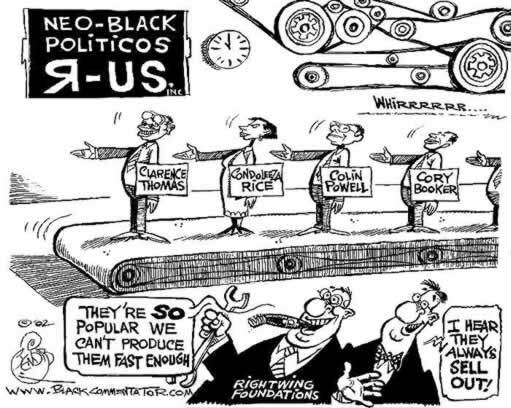 They include Hoover's Shelby Steele, one of the first members of the Bradley-funded Center for New Black Leadership; previously mentioned Bradley apparatchik Robert Woodson; and Ward Connerly, whose American Civil Rights Institute got $150,000 from Bradley, in 2000, part of Connerly's ongoing reward for successfully destroying affirmative action in California state government and higher education. A white commissioner on Flake's panel, Clint Bolick, is chief litigator for the Justice Institute, the nation's most aggressive anti-affirmative action law firm. The Institute racked up $180,000 in Bradley grants in 2000. Bolick's legal wrecking crew effectively eliminated affirmative action in the Texas state university system, and is handling Bradley-affiliated school voucher cases in Michigan, Wisconsin, and Florida. Armstrong Williams, Washington, DC. The radio and TV commentator, who is among the most obnoxious public personalities alive, is the nation's premier Black Republican right-winger for hire. His Renaissance Network television show is even titled, "The Right Side." Williams worked for Clarence Thomas at the EEOC, and for South Carolina Senator Strom Thurmond. His public relations company, the Graham Williams Group, features links to the entire galaxy of right-wing "public policy organizations," including the American Enterprise Institute, the Hoover Institute, the Hudson Institute ($250,000 from Bradley in 2000), and the Free Congress Foundation. And, of course, Bradley. Kenneth Blackwell, Republican Secretary of State, Ohio. He's on the boards of every Right-funded "school choice," "youth," or "pro-family" group imaginable. Blackwell acted as the front-line African American TV mouth for Bush during the Florida fiasco. Dr. Rufus Ellis, Tallahassee, Florida. He's one of Governor Jeb Bush's Black operatives, a salaried official of the state's weirdly hybrid Office of Public School Choice and Charter Schools, essentially a patronage unit for political propaganda. Mr. T. Willard Fair, Miami. A buddy of Governor Jeb Bush, Fair co-founded the Liberty Charter School with the younger brother. As executive director, Fair placed his Greater Miami Urban League chapter in the uniquely shameful position of being represented by the above-mentioned, Bradley-funded Institute for Justice. Jacqueline Cissell's salary as community relations director at the Greater Educational Opportunities Foundation is largely paid for with Bradley and Friedman Foundation money. There are many more examples of the slavish and mercenary nature of Cory Booker's school voucher associations. Much of the rest of the BAEO board is in the business of education, eager to expand the private school market in hope of selling more of their products. All are hopelessly entangled in an interlocking network of Right-funded organizations, with the Bradley and Walton Foundations at the center of the web. Clearly, Booker is wallowing in the funkiest corner of the political barnyard. According to People for the American Way, the Bradley Foundation distributed $365 million to various right-wing organizations between 1985 and 1999. In the process, the foundation and its collaborating institutions created the appearance of popular movements where none had previously existed, distorting the American political dialogue beyond measure. Ironically, the reflexive racism that inhibited The Right from cultivating Black proxies in the past, has been replaced by a kind of born-again enthusiasm to recruit non-whites. Ultra-conservatives have discovered that the depth of African American need, when combined with opportunism in Black political ranks, can bear strange fruit. Cory Booker's candidacy for mayor of Newark is just such fruit of a poisoned tree. Teachers organizations point out that primary and secondary public education in the U.S. generates billions in annual expenditures, plenty of public wealth for the Milton Friedmans of the world to covet. But that doesn't tell the whole story. It doesn't explain why the Hard Right is courting Cory Booker, an otherwise minor African American politician, so breathlessly that it risks unmasking and embarrassing their own candidate, their Black Hope. Perhaps it is because they have no other choice. The nation's big cities are largely Black and brown and, without legitimacy among African American voters, The Right will get nowhere in its bid to break what's left of the Democratic Party's urban coalition. It took a long time, and the racists were forced to swallow hard, but they are now prepared to seriously bankroll Blacks who are willing to dance to their tune. It's Open Admissions at the Billionaires Club! If Booker succeeds in becoming mayor of New Jersey's largest city, the historic enemies of African American dignity will have won a major test of the power of money to confuse and exploit a proud people. Blacks are the backbone of progressive electoral politics in the U.S. Unlike other ethnic groups, we have never wavered in our defense of the principles of human equality, ideals that are incompatible with the raw rule of wealth. The Hard Right, so adept at deploying its almost bottomless finances to create "instant" organizations, thinks that it can taste a dark victory, in Newark and beyond. But it's a simple matter to expose and derail them. Just follow the money. Cory Booker does. His impressive education served only to teach him the quickest route to the houses of the wealthy. Once inside the gate, Booker promptly offered his services. The Young Frankenstein is now plugged in to power, lacking only the national profile that Newark's City Hall would provide - to both the grotesquely wired candidate and the men who pay his utility bills. The latest benediction of the Booker campaign comes from columnist George F. Will, the high priest of privatization. Will has been busy for over three decades planting land mines along every step of Black people's march toward equality. His endorsement should represent the kiss of death to Booker's candidacy. Indeed, Will, whose prescription for urban unemployment is that the jobless move somewhere else, came close to giving away the entire Booker game. "Booker's plans for Newark's renaissance," Will's March 17 column informs us, "are drawn from thinkers at the Democratic Leadership Council and the Manhattan Institute think tank, and from the experiences of others such as Stephen Goldsmith, former Republican mayor of Indianapolis, a pioneer of privatization and faith-based delivery of some government services, and John Norquist, current Democratic mayor of Milwaukee, which has one of the nation's most successful school-choice programs." Well, Lordy! George F. Will spoke the truth, for once - kind of. All of Booker's ideas are scripted in the Republican Party and its affiliated think tanks. They also circulate among the right-leaning members of the Democratic Leadership Council, whose roots are in the southern branch of the party. We already know who fertilizes these brilliant ideas, designed for the sole purpose of producing a bounteous harvest for the rich. and violating students' right to religious freedom by actively discouraging parents from opting their children out of religious activities." Most of the schools involved in the Milwaukee program are Catholic. Former Congressman Floyd Flake, BAEO Chairman Howard Fuller's wife, Deborah, and the rest of the executives at predatory Edison Schools, Inc., will feast over the ruins, scavenging from coast to coast to "save" systems mortally wounded by - Flake and Fuller and the entire Bradley-Walton pirate crew. Cory Booker doesn't share many of these bright ideas with the public while on the stump in Newark. He's busy running against the influence "downtown" business exerts over Mayor Sharpe James - which is, no doubt, considerable. Booker's deals with mega-devils remain largely unknown to the man and woman in the neighborhoods. George F. Will gloats that the Booker campaign "has raised $1.5 million, partly through reform-minded supporters in New York financial circles." The venerable word "reform" is among the many progressive terms that have been stolen by the Hard Right. The people Will is really referring to are the same ultra-conservatives who fund the Manhattan, Heritage, Hoover and American Enterprise Institutes, as has been vastly documented. Cory Booker is just another of their projects, albeit an important one. The Bradley Foundation rules Milwaukee, but that city's Mayor is white. With Cory Booker in the Mayor's seat in Newark, Bradley's urban model would acquire racial legitimacy, the prize that has so long eluded the wealthy men who can, usually, buy just about anything. Booker is selling them a seat at the Black table, and an opportunity for them to tell the rest of African America, YOU are unrepresentative, out of touch with the Black masses. Look at Cory! He's down with us! Shut up, and watch the private sector work its miracles. Enjoy our largess, as it trickles down. Much more than a trickle is flowing to Booker's campaign. "He has enough to finance cable television ads, direct mail and political infantry going door to door telling people that Booker is an African American linked to neither the Klan nor the Elders of Zion," proclaims George F. Will. As one of the Hard Right's most faithful and well-paid propagandists, Will is certainly in a position to know such things. Now that you know who is financing Cory Booker's career - something that his neighborhood troops are surely unaware of - shun him. He doesn't really need or want your company, anyway. There's lots of good fixin's at the Big House. The price of admission is as expensive, or cheap, as the value one places on one's people. Booker may win in Newark, May 14. But even if he is exposed and defeated, his career is already made. The millionaires of the Hard Right love this guy, their Chosen African American Under Forty. At his age, Cory will be a blight on the political scene even longer than the rest of the Four Cs (colored conservatives counting cash): Condoleezza, Clarence, and Colin.